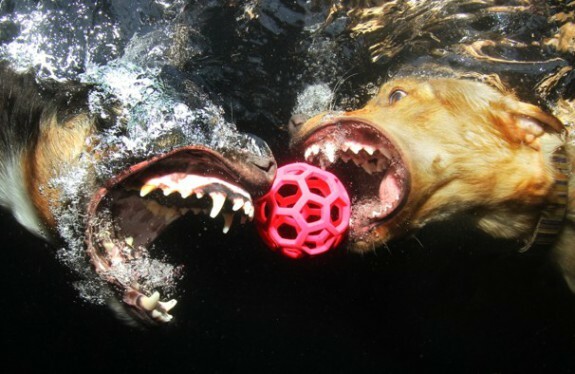 Photographer Captures Mad Dogs At Play... Underwater! A brilliant photographer on land, Casteel was shooting two dogs in southern California and decided to take shots of them splashing into a pool chasing a neon pink toy. Though the dogs are friends, Casteel sees their wild side come out as they vie in quite a primitive dog fashion for the same ball. Casteel's more than 100 under-water dog photos went viral a few weeks ago when he posted them on his website, which crashed for awhile from the traffic. Not a scuba diver or a snorkeler, Casteel took these photos with a Canon 7D with underwater housing. He told the Washington Post, I free drive and can hold my breath for 90 seconds. I weight myself down to the bottom of the pool. It’s physically demanding, the work. But the art... must make it worth the work! If you haven't seen them, visit these photos; they will blow your mind! IKEA's DUKTIG Doll Bed & Linens Set Makes A Great Pet Bed!